Water spotting on the shiny finish. Here in Cottonwood, AZ we have really hard water. That meant every time I washed the parabolic off with the hose I was getting water spots. I was afraid to rub to hard even with a soft cloth to get them off for fear of scratching the finish. Solution: Automotive car wax. I use a good quality paste car wax to coat and cover the shiny surface. It got rid of all the spots and really helped add to the shine. The great part now is that the water and oil splatters just roll off with no spotting. I think it is also protecting the reflective film. The three legged stand and leveling the burner: I really wanted more stability as it can get very windy in the area where I live. Solution: I built a heavier stand with leveling feet. Makes it a cinch to level the burner now and I can even stake it down with tent stakes if I need to. Heavy weight on the burner: I could not place too much weight on the Solar Burner like a Dutch oven or the burner ring would begin to droop. Solution: I added a slide clamp to the pole and a support rod up to the burner ring. Next I added a 5 inch longer vertical pole mount made of thicker steel. It can now support all the weight I wish to place on the burner with no fear it will damage the burner or cause drooping. Dish angle adjustment: My solar burner came with the clamp style angle adjustment. I found it hard to fine tune the angle. It would often take me more than one try to get it right. Solution: I went down to the hardware store and bought a 12 inch piece of 1/2 inch all thread, a 1/2 inch nut, and a couple of 1/4 inch washers and a 1/4 inch lock nut. I turned the all thread down to a 1/4 inch for three quarters of an inch at one end. Then I threaded the end with 1/4-20 threads. Next I bent up a u-bracket with one inch spacing between the legs. I drilled a 1/4 inch hole in the back and 5/16 inch holes in each leg. Then I built a handle that I welded onto the other end of the all thread. The last step was to weld the 1/2 inch nut on to a piece of angle to replace the stock clamp adjuster. Now the angle adjustment works very easily and smoothly with just a turn of the crank. My Solar Burner now is easier to clean, is more stable in winds. Easy to level the burner ring. Can hold very heavy kettles with lots of food and is very easy to adjust the angle of the dish. 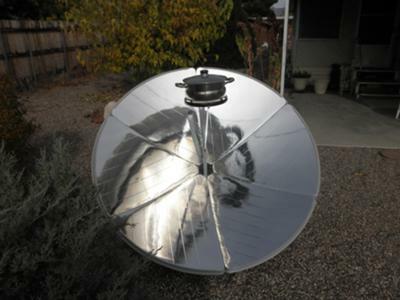 I really love this Parabolic cooker. It is amazing how well it performs and I love cooking on it. I use it every chance I get. More pictures of my "Cantinawest Solar Burner" and it modifications. Wow! this is great Dennis, Excellent tips and suggestions. Just what our site visitors will appreciate. Of course not everyone is as "handy" as you seem to be, but I am sure there are many who will probably follow suit. Also you sure did a great job with the new stand/base for the cooker. As for reinforcing and supporting the pot receptacle with an angled bracing bar; that is exactly what I suggest to customers that inquire about putting heavier cookware/food on it, to add a "strengthening" "cross bar", and you have gone and shown exactly how to easily do it. I just received my Solar Burner. How do you focus this thing? There are four degrees of freedom: the dish rotates around the base and also tilts up and down and the pot stand can be continuously adjusted both vertically and horizontally. So it's really a two part thing I suppose, first get the pot stand in the focal point and then get the dish focused on the sun. But how do you do that? What's the procedure?